These pieces on this page have all been resin impregnated under high vaccum, sometimes there were additional steps also. Some woods, such as rosewoods or other oily woods have to undergo other steps to allow good penetration of the plastic resin. Some providers don't take these extra steps, which can result in just getting the outer 1/4 inch stabilized instead of the whole piece. 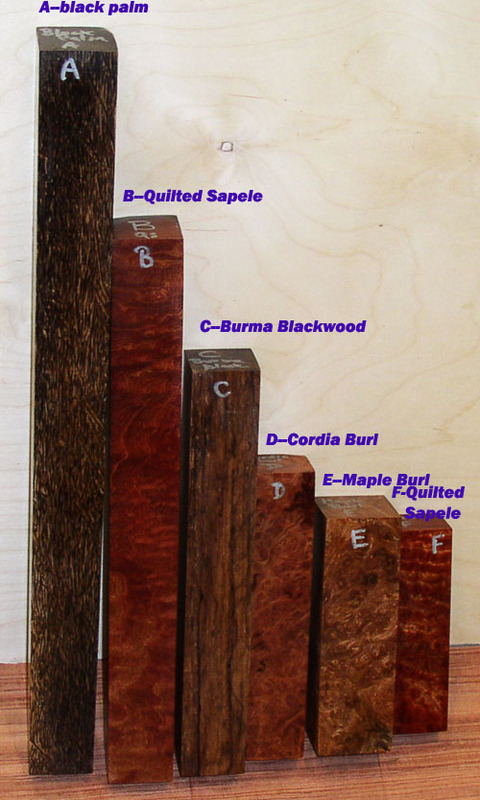 Note that some also claim that they have stabilized wood types such as snakewood or desert ironwood. 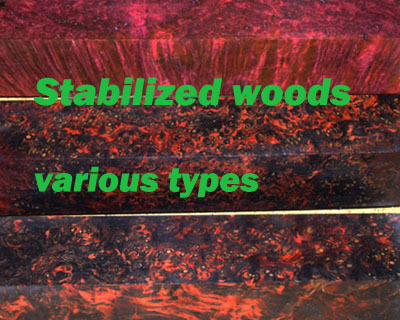 This might be possible with some methods, but since there is so little empty space in these dense woods my opinion is that the actual stabilizing effect on the wood is minimal. It is relatively expensive to create stabilized pieces, and most applications work great without using stabilization. 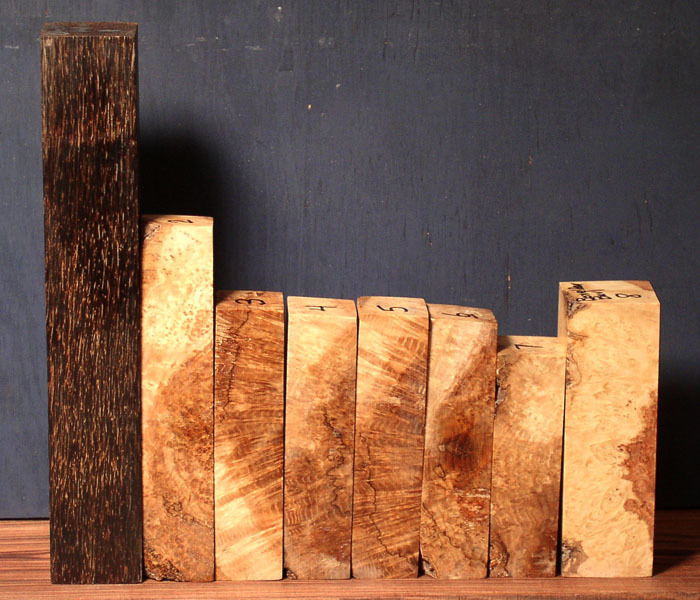 But for certain unstable wood types, and also for some uses like pieces that will be subjected to sun, handling or weather, stabilization is the way to go. We have to cut every piece oversize, the process then warps the pieces due to the pressure involved, and the piece is reduced in size to make the pieces you see. So it takes extra wood, shipping to the stabilizer and shipping back, as well as paying for the resin work itself. This is what creates the extra cost. 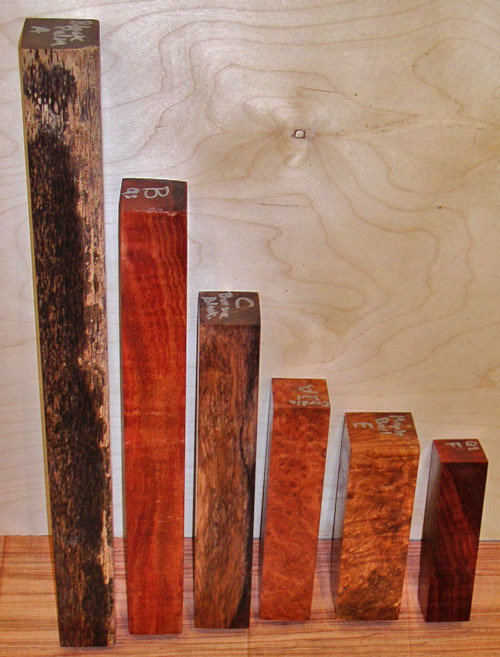 IN MOST CASES, STABILIZATION COSTS MORE THAN THE WOOD ITSELF. Many feel it is worth it to get greater ease of working as well as a piece which can stand up to more difficult wear, like knife handles or pens. NOTE: NOT EVERY STABILIZED WOOD IS ON THIS PAGE, GO TO THE PEN BLANK PAGE FOR PEN BLANKS AND SEE THE ONES MARKED AS STABILIZED. 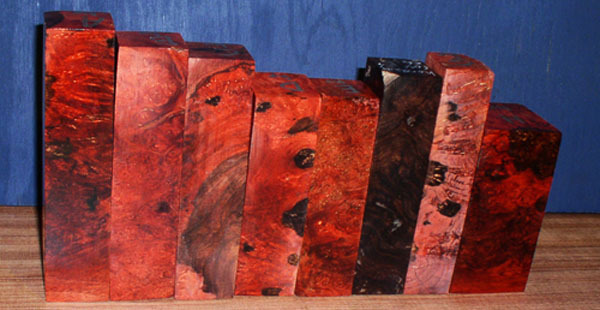 ALSO, BOXELDER, AMBOYNA BURL AND BUCKEYE BURL HAVE THEIR OWN PAGES. THE FIGURED VARIOUS PAGE SOMETIMES ALSO HAS STABILIZED PIECES. 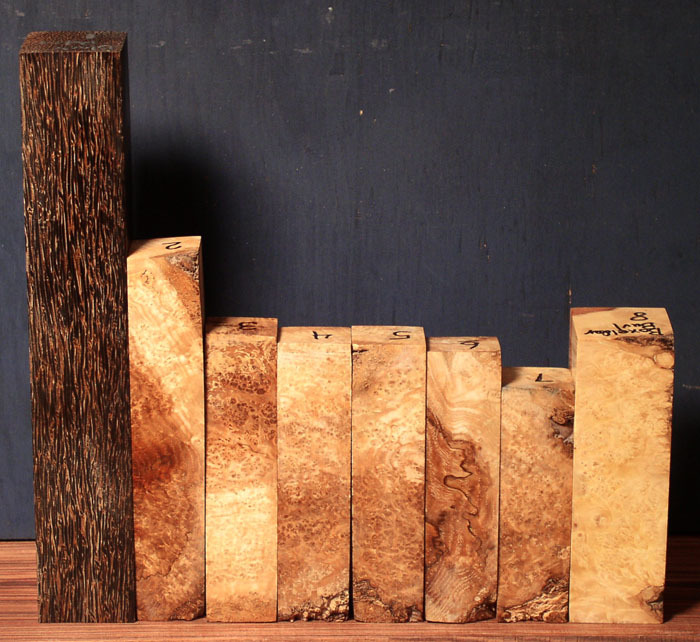 SOMETIMES YOU WILL FIND PEN BLANKS HERE TOO IF THEY ARE NOT A STOCK OFFERING BUT A SHORT TERM ONE. 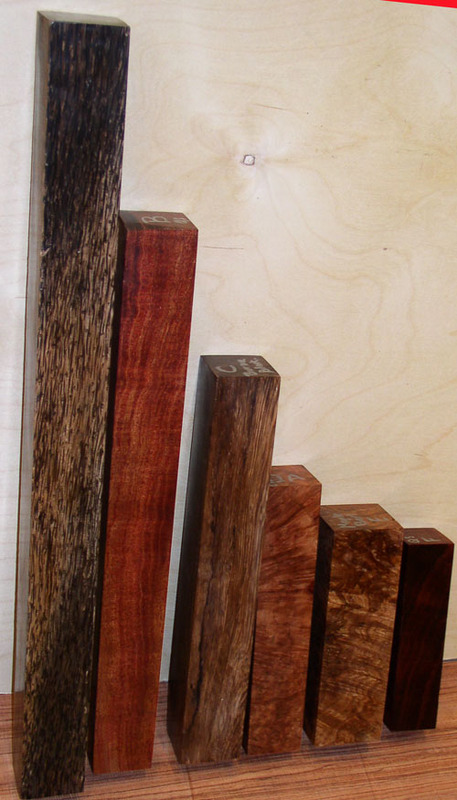 FOR NON-STABILIZED WOODS AT REGULAR PRICES, USE THE LINKS DOWN THE LEFT OF THE PAGE. 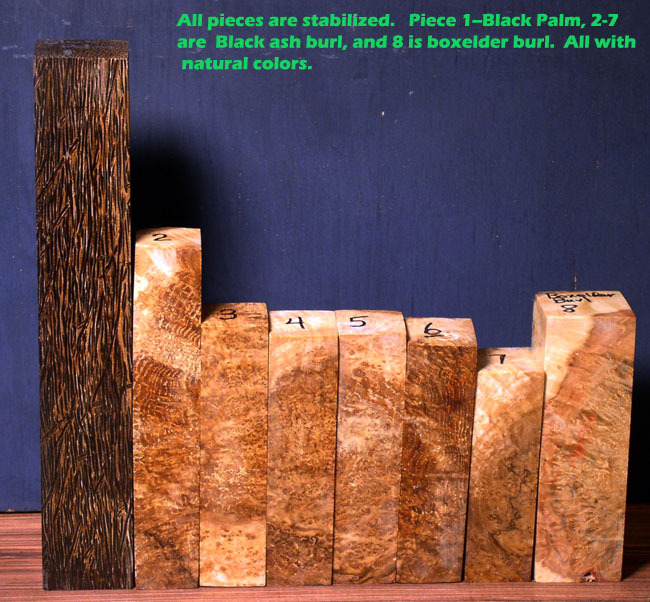 Black Palm, ash burl and boxelder burl, high quality figure. Please order by number below. If the item is missing below that piece is sold. Actual pieces shown, Click photo for second view . It is now difficult to get pieces like this in masur birch as global prices are so high that no one is importing it anymore. We STABILIZED these high quality pieces from our old stock. 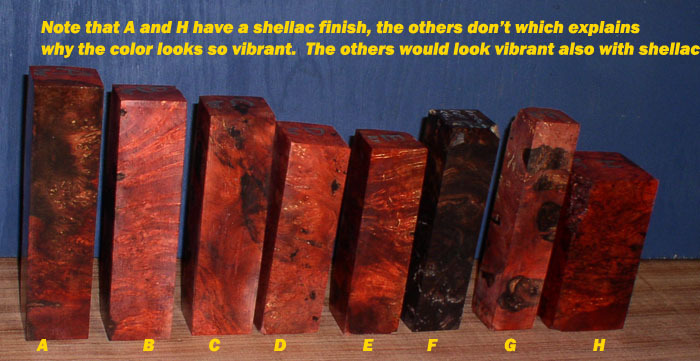 A is natural color and B is with added orange dye. Very dense when stabilized. If not listed below, then it is sold. 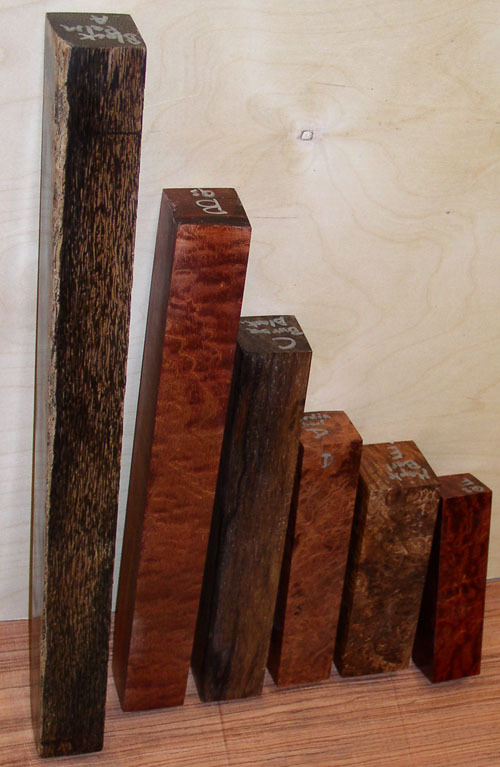 A nice variety of stabilized pieces in different sizes and types. Please order by number below. If the item is missing below or you get a note that it is unavailable when you put it in the shopping cart, that piece is sold. 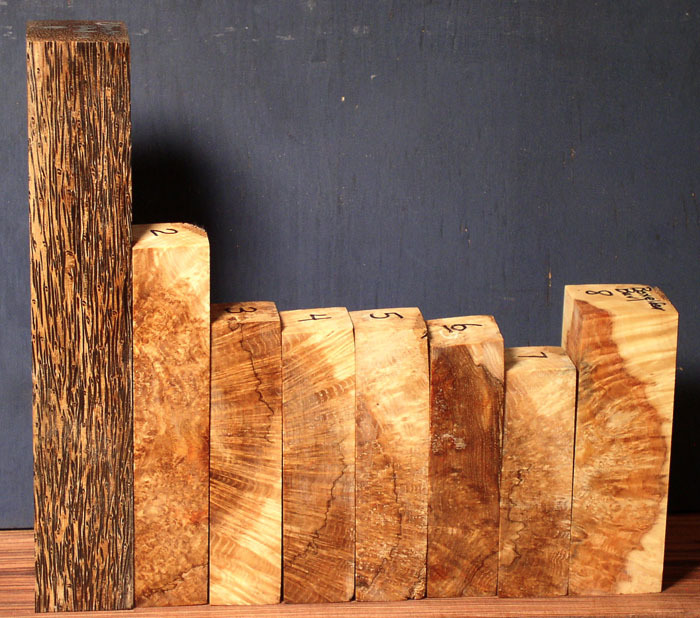 Stabilized pieces, many in types not usually available stabilized. Professionally Stabilized by resin impregnation under high pressure. Stabilized pieces. 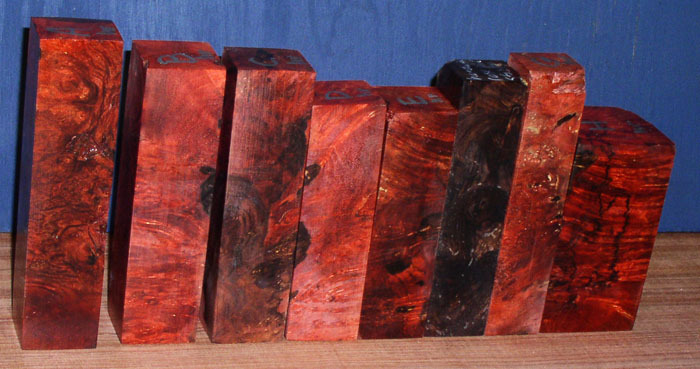 This is Honduran rosewood burl, one of the few burls that can cost more than Amboyna burl . Very rare in high figure. Professionally Stabilized by resin impregnation under high pressure. NOTE: Piece F is natural color. Others dyed red.